It all started with a discussion in late 2009 and a request to Bruce Lang, Vice-President of ARCHERY SA by Jim Hale (former ARCHERY SA Development Officer and founding member of The Farm Indoor Archery Club), who asked that his enquiries about the potential use of land owned by Adelaide Hills Council at Mt Charles near Charleston be pursued. He had intended arranging a meeting to view the area, but his failing health had prevented it. ARCHERY SA was well aware of a lack of archery near the high growth areas of Mt Barker and the central hills, but the lack of the wherewithall to get it going had held it back. The visit to the Mt Charles facility was conducted in early December, 2009 and an invitation to submit an expression of interest was made by the Adelaide Hills Council representative. The EoI was developed and submitted in February, 2010 (with further information provided in April, 2010) and, in addition, Bruce Lang published the following article in the Mt Barker Courier on 10 March. This is the question that ARCHERY South Australia is asking. Anyone interested in helping develop an archery Club is encouraged to contact ARCHERY SA. Archery has been a resilient sport in South Australia and can be traced back to the early days of the Colony. However, there is little opportunity between the Adelaide Plains and Strathalbyn for people of the Hills to practice this noble pursuit. Archery is one of the few sports that can be practised by anyone from 8 – 80 (and beyond!) and can be simply a thoroughly enjoyable recreation or take you to World Championships and Olympic Games. So, if there is sufficient interest, an application to a local Council will be made to assist this most ancient, yet technologically advanced sport to find a highlands home base. At this stage there is no location decided upon, but the intention is to create a target and field archery club which can be developed into a regional facility for use by locals, schools and ARCHERY SA. To express an interest, contact ARCHERY SA Vice-President, Bruce Lang by e-mail at archeryinthehills@gmail.com by the end of March. However, the germ of an idea for a Club in the Hills had been planted and several responses to the call for interest were received. The hunt for a venue continued through 2011, including Oakbank Racecourse and Oakbank Area School, but those came to nought. The landlords were keen for use of their area by sport, but at commercial rates, which would have made the venture unviable. In early, 2013 Phil Storer who had been one of the respondents to the original article in the Courier (and who later became one of the foundation members of HILLS ARCHERS) advised he had been talking with his dental hygienist, Pam Prior. Pam was involved with a polocrosse club at Lobethal and they were looking for other sports to share the facility. 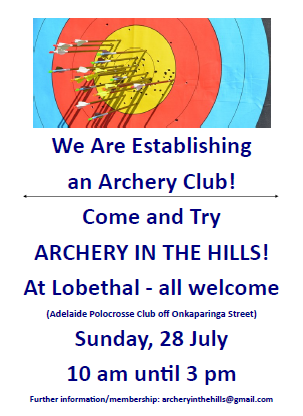 A visit was conducted in April, 2013 which determined the eminent suitability for archery and, from that (with verbal approval from the Adelaide Polocrosse Club) a come’n’try day was programmed for 28 July. A flyer was developed and distributed to local schools and supermarkets/community boards. Phil and Bruce met face-to-face for the first time on 6 June at the Crafer’s Hotel to develop the way forward. Provision was made for a longer target for those existing archers who might front up on the day. 28 July: a resounding success! Estimated that 50 people had a go. Support from several members of other archery Clubs was also appreciated. A meeting of people who registered an interest at the Come and Try day in forming a Club was proposed for 7.30 pm Wednesday, 21 August, 2013 in the meeting room of the Lobethal Centennial Hall. Unfortunately, it was a cold and wet night and Bruce was the only attendee! All was not lost however, with a further meeting convened with Phil Storer (former member of SVAC), Sandy Hancock (member of AAC), Gordon Kay (former member of KA) and Bruce Lang (member of EFA) at the Woodside Hotel on 10 September, 2013 and the Club was formed along with the presentation of a draft Constitution and Rules. The Club arranged a meeting with the Adelaide Polocrosse Club to determine the rate of rental and other arrangements. This was held on 30 September. Incorporation of HILLS ARCHERS was approved, effective 23 January, 2014. After some negotiations, the final hire agreement with APC was signed and sealed on 14 March, 2014.